Karolina Maria Anastasia Kiniger grew up in the idyllic surroundings of some of Austria’s most beautiful countryside, a picture postcard setting of towering mountains and crystal clear lakes. The youngster, the eldest of four sisters, attended a convent school and had hoped to become a doctor but, as the Third Reich intruded inexorably into her homeland, she found herself living under the dark shadow of Nazi rule. 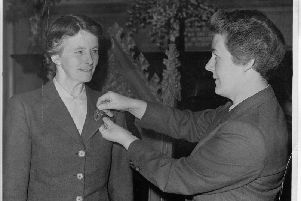 During the Second World War, after embarking on her studies at Vienna University following Austria’s annexation to Germany, she endured forced labour, under the so-called Voluntary Labour Service, on farmland in Sudetenland and Galicia, and never did fulfil her ambition to be a medic. But, when the war was over, the opportunity to embrace a philosophy she assumed had been banned under the Nazis set her on the road to becoming a gifted and indefatigable teacher and ultimately led her to Edinburgh where her no-nonsense yet intuitive approach to education inspired generations of pupils. She continued to teach until well into her 80s and remained respected and appreciated by her former pupils who helped her celebrate milestone birthdays decades after they had left her class. The daughter of a farmer, who later became a postmaster, she was born in the village of Hinterstoder, in a valley in Upper Austria, surrounded by high peaks. She was educated at the local school before going on to the Freistadt Gymnasium for a year, after which she attended a girls’ school. When the family moved to the Salzkammergut, the spectacularly beautiful lake district right in the heart of Austria, she became a convent school pupil. Church attendance was compulsory and there, aged 12, she became an agnostic, partly as a reaction to what she called “the Roman Catholic dictatorship”. Just after the Anschluss in 1938 that saw Austria become part of Germany, she went to university in Vienna to study history and German. Medicine was not pursued, partly because of the excruciating experience of having her tonsils removed under local anaesthetic – she vowed never to be in a position to inflict such pain on others. Her studies were interrupted, however with duties for the Nazis, “voluntarily” working the land belonging to farmers in Sudetenland, on the border of Bohemia, and, in 1942, in Galicia, later part of Poland. Miss Kiniger had seen Hitler in person more than once and many years later would use her eyewitness account to explain some of the history of the Second World War to her pupils. During the Battle of Stalingrad, which raged over the autumn and winter of 1942-43, she had a vision of how future Soviet and Anglo-American interests would be mapped out in Europe, imagining northern Austria controlled by the Soviets and south of the Danube by the Americans. It was not until May 1945, after the Yalta conference earlier that year, that the demarcation followed that same line with the river separating the two zones. After the war she lived in Linz on the Danube, staying with an aunt in the American sector south of the river while her parents’ home was in the north in the Russian area. In 1946, at the instigation of one of her sisters, she attended a lecture on anthroposophy, the spiritual science founded on the work of Austrian philosopher Rudolf Steiner. She had not a clue what the subject was, save that it may well have been prohibited under Nazi rule. Once in the lecture hall, it was a revelation. Its ethos, based on a modern spiritual path of self-development that recognises and respects the freedom of every individual, immediately made sense to her and she began attending lectures and a study group. She went on to study the dance-like art form eurythmy and creative eurythmy in Vienna and, in 1953, during a conference in Switzerland, met one of the Edinburgh Steiner School’s founding teachers, Inez Arnold. She was interviewed for a teaching post in Edinburgh but, before arriving in the Scots capital, spent a term learning English at Michael Hall School in Forest Row, East Sussex, Britain’s oldest Steiner School. Miss Kiniger began teaching in Edinburgh in 1954, initially doing creative eurythmy with individual pupils and giving German lessons, before becoming a class teacher – a role performed by each teacher for a period of eight years at a time. Her charges ranged from age six to 14. In the early 1970s she took her class of approximately 36 on a two-month exchange visit to a Steiner school in Vienna. A formidable presence, she brooked no nonsense on the three-day train journey, even managing to keep an eye on mischief-makers at three in the morning. The trip was an extraordinary experience for the youngsters and much of their daily lesson concentrated on the Second World War. Their teacher was able to give them a personal insight not only into the history of the conflict but, having witnessed the Fuhrer in real life, could describe his deep blue eyes and the inexplicable charismatic quality that allowed him to influence so many people in pursuit of his abhorrent aims. Also during the 1970s she was asked to visit Russia, to meet others interested in anthroposophy. The movement was still underground at that time and much care was taken in preparation for her journey, one that she repeated regularly for another 30 years. She took a sabbatical in 1974-75, travelling to New Zealand where she also taught. She returned to Scotland, via Russia on the Trans Siberian Express, and set up the Steiner teacher training course in Edinburgh in 1976 with colleague Lawrence Edwards. A stocky powerhouse of a woman, known for both her spiritual insight and clear opinions, her contribution to the school was enormous, practically and spiritually. She continued to teach until about ten years ago and remained active in the Anthroposophical Society, locally and internationally. She also enjoyed a large network of friends and acquaintances and kept her sharp mind fully occupied with interests including reading, music, opera, current affairs and scientific advances. On her 90th birthday she was invited to address the entire Steiner school during assembly and did so without a microphone, her words leaving a deep impression on every pupil from six to 18. She is survived by one sister, her nephew and nieces.